For other uses, see British Invasion (disambiguation). The arrival of the Beatles in the U.S. in 1964 marked the start of the British Invasion. The British Invasion was a cultural phenomenon of the mid 1960s, when rock and pop music acts from the United Kingdom and other aspects of British culture, became popular in the United States and significant to the rising "counterculture" on both sides of the Atlantic. Pop and rock groups such as the Beatles, the Rolling Stones, the Who, the Kinks, the Dave Clark Five, Herman's Hermits, the Zombies, the Hollies, and the Animals were at the forefront of the "Invasion." The rebellious tone and image of US rock and roll and blues musicians became popular with British youth in the late 1950s. While early commercial attempts to replicate American rock and roll mostly failed, the trad jazz–inspired skiffle craze, with its do it yourself attitude, was the starting point of several British Billboard singles. Young British groups started to combine various British and American styles in different parts of the U.K., such as the 1962 movement in Liverpool known as Merseybeat or the "beat boom". That same year featured three instrumentals, each from an act with British roots, to reach the Hot 100's summit. This included the Tornados' instrumental "Telstar", written and produced by Joe Meek, becoming the first record by a British group to reach number one on the US Hot 100. All were preceded by British jazz musician Kenny Ball peaking at #2 on 17 March 1962 on the Hot 100 with the instrumental "Midnight in Moscow". Some observers have noted that US teenagers were growing tired of singles-oriented pop acts like Fabian. The Mods and Rockers, two youth "gangs" in mid-1960s Britain, also had an impact in British Invasion music. Bands with a Mod aesthetic became the most popular, but bands able to balance both (e.g. the Beatles) were also successful. Fans and media swarm the Beatles at Schiphol Airport in 1964. In October 1963, the first newspaper articles about the frenzy in England surrounding the Beatles appeared nationally in the US. The Beatles' November 4 Royal Variety Performance in front of the Queen Mother sparked music industry and media interest in the group. During November, a number of major American print outlets and two network television evening programs published and broadcast stories on the phenomenon that became known as "Beatlemania". 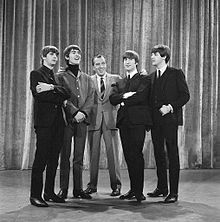 On December 10, CBS Evening News anchor Walter Cronkite, looking for something positive to report, re-ran a Beatlemania story that originally aired on the 22 November 1963 edition of the CBS Morning News with Mike Wallace but was shelved that night because of the assassination of US President John Kennedy. After seeing the report, 15-year-old Marsha Albert of Silver Spring, Maryland, wrote a letter the following day to disc jockey Carroll James at radio station WWDC asking, "Why can't we have music like that here in America?" On December 17 James had Miss Albert introduce "I Want to Hold Your Hand" live on the air. WWDC's phones lit up, and Washington, D.C., area record stores were flooded with requests for a record they did not have in stock. James sent the record to other disc jockeys around the country sparking similar reaction. On December 26, Capitol Records released the record three weeks ahead of schedule. The release of the record during a time when teenagers were on vacation helped spread Beatlemania in the US. On December 29, The Baltimore Sun, reflecting the dismissive view of most adults, editorialized, "America had better take thought as to how it will deal with the invasion. Indeed a restrained 'Beatles go home' might be just the thing." In the next year alone, the Beatles would have 30 different listings on the Hot 100. On January 3, 1964, The Jack Paar Program ran Beatles concert footage licensed from the BBC "as a joke," but it was watched by 30 million viewers. While this piece was largely forgotten, Beatles producer George Martin has said it "aroused the kids' curiosity". In the middle of January 1964, "I Want to Hold Your Hand" appeared suddenly, then vaulted to the top of nearly every top 40 music survey in the United States, launching the Fab Four's sustained, massive output. "I Want to Hold Your Hand" ascended to number one on the January 25, 1964 edition of Cash Box magazine (on sale January 18) and the February 1, 1964 edition of the Hot 100. On February 7, 1964, the CBS Evening News ran a story about the Beatles' United States arrival that afternoon in which the correspondent said, "The British Invasion this time goes by the code name Beatlemania." Two days later, on Sunday, February 9, they appeared on The Ed Sullivan Show. Nielsen Ratings estimated that 45 percent of US television viewers that night saw their appearance. According to Michael Ross, "It is somewhat ironic that the biggest moment in the history of popular music was first experienced in the US as a television event." The Ed Sullivan Show had for some time been a "comfortable hearth-and-slippers experience." Not many of the 73 million viewers watching in February 1964 would fully understand what impact the band they were watching would have. The Beatles soon incited contrasting reactions and, in the process, generated more novelty records than anyone — at least 200 during 1964–1965 and more inspired by the "Paul is dead" rumour in 1969. Among the many reactions, favoring the hysteria were British girl group the Carefrees' "We Love You Beatles" (#39 on 11 April 1964) and the Patty Cakes' "I Understand Them", subtitled "A Love Song to the Beatles". Disapproving the pandemonium were American group the Four Preps' "A Letter to the Beatles" (#85 on 4 April 1964) and American comedian Allan Sherman's "Pop Hates the Beatles." On April 4, the Beatles held the top five positions on the Billboard Hot 100 singles chart, and to date, no other act has simultaneously held even the top four. The Beatles also held the top five positions on Cash Box's singles chart that same week, with the first two positions reversed from the Hot 100. The group's massive chart success, which included at least two of their singles holding the top spot on the Hot 100 during each of the seven consecutive years starting with 1964, continued until they broke up in 1970. One week after the Beatles entered the Hot 100 for the first time, Dusty Springfield, having launched a solo career after her participation in the Springfields, became the next British act to reach the Hot 100, peaking at number 12 with "I Only Want to Be with You". [nb 1] During the next three years, many more British acts with a chart-topping US single would appear. [nb 2] As 1965 approached, another wave of British Invasion artists emerged which usually consisted of groups playing in a more pop style, such as the Hollies or the Zombies or with a harder-driving, blues-based approach. [excessive citations] On May 8, 1965, the British Commonwealth came closer than it ever had or would to a clean sweep of a weekly Hot 100's Top 10, lacking only a hit at number two instead of "Count Me In" by the US group Gary Lewis & the Playboys. The British Commonwealth also nearly swept the Cash Box singles chart's top ten the previous week, lacking only a hit at number six instead of "Count Me In". That same year, half of the 26 Billboard Hot 100 chart toppers (counting the Beatles' "I Feel Fine" carrying over from 1964) belonged to British acts. The British trend would continue into 1966 and beyond. British Invasion acts also dominated the music charts at home in the United Kingdom. The musical style of British Invasion artists, such as the Beatles, had been influenced by earlier US rock 'n' roll, a genre which had lost some popularity and appeal by the time of the Invasion. However, a subsequent handful of white British performers, particularly the Rolling Stones and The Animals, would appeal to a more 'outsider' demographic, essentially reviving and popularizing, for young people at least, a musical genre rooted in the blues, rhythm, and black culture, which had been largely ignored or rejected when performed by black US artists in the 1950s. Such bands were sometimes perceived by American parents and elders as rebellious and unwholesome unlike parent-friendly pop groups, such as the Beatles. The Rolling Stones would become the biggest band other than the Beatles to come out of the British Invasion, topping the Hot 100 eight times. Sometimes, there would be a clash between the two styles of the British Invasion, the polished pop acts and the grittier blues-based acts due to the expectations set by the Beatles. Eric Burdon of the Animals said "They dressed us up in the most strange costumes. They were even gonna bring a choreographer to show us how to move on stage. I mean, it was ridiculous. It was something that was so far away from our nature and, um, yeah we were just pushed around and told, 'When you arrive in America, don't mention the [Vietnam] war! You can't talk about the war.' We felt like we were being gagged." "Freakbeat" is a term sometimes given to certain British Invasion acts closely associated with the mod scene during the Swinging London period, particularly harder-driving British blues bands of the era that often remained obscure to US listeners, and who are sometimes seen as counterparts to the garage rock bands in America. Certain acts, such as the Pretty Things and the Creation, had a certain degree of chart success in the UK and are often considered exemplars of the form. [excessive citations] The emergence of a relatively homogeneous worldwide "rock" music style marking the end of the "invasion" occurred in 1967. Outside music, other aspects of British arts became popular in the US during this period and led US media to proclaim the United Kingdom as the center of music and fashion. The Beatles movie A Hard Day's Night marked the group's entrance into film. Mary Poppins, released on August 27, 1964, and starring English actress Julie Andrews as the titular character, became the most Oscar-winning and Oscar-nominated Disney film in history, and My Fair Lady, released on December 25, 1964, starring British actress Audrey Hepburn as Cockney flower girl Eliza Doolittle, won eight Academy Awards. Besides the Bond series which commenced with Sean Connery as James Bond in 1962, films with a British sensibility such as the "Angry Young Men" genre, What's New Pussycat? and Alfie styled London Theatre. A new wave of British actors such as Peter O'Toole and Michael Caine intrigued US audiences. Four of the decade's Academy Award winners for best picture were British productions, with the epic Lawrence of Arabia, starring O'Toole as British army officer T. E. Lawrence, winning seven Oscars in 1963. British television series such as Danger Man (renamed Secret Agent in its U.S. airings), The Saint and The Avengers began appearing on American screens, inspiring a series of American-produced espionage programs such as I Spy, The Man From U.N.C.L.E., and the parody series Get Smart. By 1966, spy series (both British and American) had emerged as a favorite format of American viewers, alongside Westerns and rural sitcoms. Television shows that featured uniquely American styles of music, such as Sing Along with Mitch and Hootenanny, were quickly canceled and replaced with shows such as Shindig! and Hullabaloo that were better positioned to play the new British hits, and segments of the new shows were taped in England. Fashion and image marked the Beatles out from their earlier US rock and roll counterparts. Their distinctive, uniform style "challenged the clothing style of conventional US males," just as their music challenged the earlier conventions of the rock and roll genre. "Mod" fashions, such as the mini skirt from "Swinging London" designers such as Mary Quant and worn by early supermodels Twiggy, Jean Shrimpton and other models, were popular worldwide. John Crosby wrote, "The English girl has an enthusiasm that American men find utterly captivating. I'd like to import the whole Chelsea girl with her 'life is fabulous' philosophy to America with instructions to bore from within." Even while longstanding styles remained popular, US teens and young adults started to dress "hipper." The evolution of the styles of the British Invasion bands also showed in US culture, as some bands went from more clean cut to being more hippie. In anticipation of the 2013 50th anniversary of the British Invasion, comics such as Nowhere Men, which are loosely based on the events of it, gained popularity. The British Invasion had a profound impact on popular music, internationalizing the production of rock and roll, establishing the British popular music industry as a viable centre of musical creativity, and opening the door for subsequent British performers to achieve international success. In America, the Invasion arguably spelled the end of the popularity of instrumental surf music, pre-Motown vocal girl groups, the folk revival (which adapted by evolving into folk rock), teenage tragedy songs, Nashville country music (which also faced its own crisis with the deaths of some of its biggest stars at the same time), and temporarily, the teen idols that had dominated the American charts in the late 1950s and 1960s. It dented the careers of established R&B acts like Chubby Checker and temporarily derailed the chart success of certain surviving rock and roll acts, including Ricky Nelson, Fats Domino, the Everly Brothers and Elvis Presley (who nevertheless racked up 30 Hot 100 entries from 1964 through 1967). It prompted many existing garage rock bands to adopt a sound with a British Invasion inflection and inspired many other groups to form, creating a scene from which many major American acts of the next decade would emerge. The British Invasion also played a major part in the rise of a distinct genre of rock music and cemented the primacy of the rock group, based around guitars and drums and producing their own material as singer-songwriters. Though many of the acts associated with the invasion did not survive its end, many others would become icons of rock music. The claim[according to whom?] that British beat bands were not radically different from US groups like the Beach Boys and damaged the careers of African-American and female artists was made[when?] about the Invasion. However, the Motown sound, exemplified by the Supremes, the Temptations, and the Four Tops, each securing its first top 20 record during the Invasion's first year of 1964 and following up with many other top 20 records, besides the constant or even accelerating output of the Miracles, Gladys Knight & the Pips, Marvin Gaye, Martha & the Vandellas, and Stevie Wonder, actually increased in popularity during that time. Other US groups also demonstrated a similar sound to the British Invasion artists and in turn highlighted how the British 'sound' was not in itself a wholly new or original one. Roger McGuinn of the Byrds, for example, acknowledged the debt that American artists owed to British musicians, such as the Searchers, but that "they were using folk music licks that I was using anyway. So it's not that big a rip-off." Both the US sunshine pop group the Buckinghams and the Beatles-influenced US Tex-Mex act the Sir Douglas Quintet adopted British-sounding names, and San Francisco's Beau Brummels took their name from the same-named English dandy. Roger Miller had a 1965 hit record with a song titled "England Swings". Englishman Geoff Stephens (or John Carter) reciprocated the gesture a la Rudy Vallée a year later in the New Vaudeville Band's "Winchester Cathedral". Even as recently as 2003, "Shanghai Knights" made the latter two tunes memorable once again in London scenes. Anticipating the Bay City Rollers by more than a decade, two British acts that reached the Hot 100's top 20 gave a tip of the hat to America: Billy J. Kramer with the Dakotas and the Nashville Teens. The British Invasion also drew a backlash from some American bands, e.g., Paul Revere & the Raiders and New Colony Six dressed in Revolutionary War uniforms, and Gary Puckett & The Union Gap donned Civil War uniforms. Garage rock act the Barbarians' "Are You a Boy or Are You a Girl" contained the lyrics "You're either a girl, or you come from Liverpool" and "You can dance like a female monkey, but you swim like a stone, Yeah, a Rolling Stone." In Australia, the success of the Seekers and the Easybeats (the latter a band formed mostly of British emigrants) closely paralleled that of the British Invasion. The Seekers had two Hot 100 top 5 hits during the British Invasion, the #4 hit "I'll Never Find Another You" (recorded at London's Abbey Road Studios) in May 1965 and the #2 hit "Georgy Girl" in February 1967. The Easybeats drew heavily on the British Invasion sound and had one hit in the United States during the British Invasion, the #16 hit "Friday on My Mind" in May 1967. According to Robert J. Thompson, director of the Center for the Study of Popular Television at Syracuse University, the British invasion pushed the counterculture into the mainstream. The historical conclusion of British Invasion is ambiguous. American bands regained mainstream prominence in the late 1960s, and along with it, the wave of anglophilia largely faded as American culture shifted in response to the Vietnam War and the resulting civil unrest. Nevertheless, British bands retained their popularity throughout the decade and into the 1970s. Later in that decade, British bands such as Badfinger and the Sweet, and American band the Raspberries, are considered to have evolved the genre into power pop. In 1978, two rock magazines wrote cover stories analyzing power pop as a savior to both the new wave and the direct simplicity of rock. Along with the music, new wave power impacted current the fashion, such as the mod style of the Jam or the skinny ties of the burgeoning Los Angeles scene. Several power pop artists were commercially successful; most notably the Knack, whose "My Sharona" was the highest ranked U.S. single of 1979. Although the Knack and power pop fell out of mainstream popularity, the genre continues to have a cult following with occasional periods of modest success. A subsequent wave of British artists rose to popularity in the early 1980s as British music videos appeared in American media, leading to what is now known as the "Second British Invasion". Another wave of British mainstream prominence in U.S. music charts came in the mid-1990s with the brief success of Spice Girls, Oasis and Robbie Williams. At least one British act would appear somewhere on the Hot 100 every week from November 2, 1963 until April 20, 2002, originating with the debut of the Caravelles' "You Don't Have to Be a Baby to Cry". British acts declined in popularity throughout the 1990s, and in the April 27, 2002 issue of Billboard, none of the songs on the Hot 100 were from British artists; that week, only two of the top 100 albums, those of Craig David and Ozzy Osbourne, were from British artists. The most recent recognized movement came in the mid to late 2000s when British R&B and soul artists such as Amy Winehouse, Estelle, Joss Stone, Duffy, Natasha Bedingfield, Florence Welch, Adele, Floetry, Jessie J, Leona Lewis, Jay Sean and Taio Cruz enjoyed huge success in the U.S. charts, which led to talk of a "Third British Invasion" or a "British Soul Invasion". ^ She soon followed up with several other hits, becoming what AllMusic described as "the finest white soul singer of her era." On the Hot 100, Dusty's solo career lasted almost as long, albeit with little more than one quarter of the hits, as the Beatles' group career before their breakup. ^ Peter and Gordon, The Animals, Manfred Mann, Petula Clark, Freddie and the Dreamers, Wayne Fontana and the Mindbenders, Herman's Hermits, the Rolling Stones, the Dave Clark Five, the Troggs, Donovan, and Lulu in 1967, would have one or more number one singles in the US. Other Invasion acts included the Searchers, Billy J. Kramer, the Bachelors, Chad & Jeremy, Gerry and the Pacemakers, the Honeycombs, Them (and later its lead singer, Van Morrison), Tom Jones, the Yardbirds (whose guitarist Jimmy Page would later form Led Zeppelin), the Spencer Davis Group, the Small Faces, and numerous others. The Kinks, although considered part of the Invasion, initially failed to capitalize on their success in the US after their first three hits reached the Hot 100's top 10 (in part due to a ban by the American Federation of Musicians) before resurfacing in 1970 with "Lola" and in 1983 with their biggest hit, "Come Dancing". ^ Ira A. Robbins. "British Invasion (music) - Britannica Online Encyclopedia". Britannica.com. Retrieved January 18, 2011. ^ James E. Perone (2004). Music of the Counterculture Era. Greenwood Publishing Group. pp. 22–. ISBN 978-0-313-32689-9. ^ a b Stephen Thomas Erlewine. "The Kinks - Music Biography, Streaming Radio and Discography - AllMusic". AllMusic. ^ Unterberger, Richie. "The Dave Clark Five - Biography - AllMusic". AllMusic. ^ Perone, James E. Mods, Rockers, and the Music of the British Invasion. Westport, CT: Praeger,2009. Print. ^ "Lonnie Donegan > Charts and Awards > Billboard singles". AllMusic. Retrieved February 14, 2011. ^ Eder, Bruce. "Lonnie Donegan - Music Biography, Streaming Radio and Discography - AllMusic". AllMusic. ^ a b c d Ira A. Robbins. "Encyclopædia Britannica Article". Britannica.com. Retrieved January 18, 2011. ^ Morrison, Craig. American Popular Music. British Invasion (New York: Facts on File, 2006), pp. 32-4. ^ J. Gould, Can't Buy Me Love: The Beatles, Britain, and America (New York, Harmony Books, 2007), pp. 344-5. ^ a b c d e When the Beatles hit America CNN February 10, 2004. ^ Whitburn, Joel (1990). The Billboard Hot 100 Charts: The Sixties (26 May 1962, 7 July 1962, 22 December 1962 - 5 January 1963). Menomonee Falls, Wisconsin: Record Research, Inc. ISBN 0-89820-074-1. ^ Perone, James (2009). Mods, Rockers, and the Music of the British Invasion. Westport, Connecticut: Praeger. ^ "The Beatles in America: We Loved Them, Yeah, Yeah, Yeah". Newseum. February 5, 2009. Archived from the original on November 26, 2010. Retrieved June 29, 2012. ^ a b c d e f g Tweet the Beatles! How Walter Cronkite Sent The Beatles Viral ANDRE IVERSEN FOR THE WIN! by Martin Lewis based on information from "THE BEATLES ARE COMING! The Birth of Beatlemania in America" by Bruce Spitzer" July 18, 2009. ^ Whitburn, Joel (2003). Top Pop Singles 1955-2002. Menomonee Falls, Wisconsin: Record Research, Inc. pp. 44, 45. ISBN 0-89820-155-1. ^ "1 February 1964 Hot 100". Billboard. Retrieved February 16, 2012. ^ a b c Ross, Michael (August 5, 2010). "Fab Four + 40: Looking back on the British invasion". TODAY.com. ^ Puterbaugh, Parke (July 14, 1988). "The British Invasion: From the Beatles to the Stones, The Sixties Belonged to Britain". Rolling Stone. Retrieved October 2, 2018. ^ "Beatlesongs!". AlbumLinerNotes.com. Retrieved May 1, 2014. ^ Whitburn, Joel (1990). The Billboard Hot 100 Charts: The Sixties (11 April 1964). Menomonee Falls, Wisconsin: Record Research, Inc. ISBN 0-89820-074-1. ^ "I Understand Them (A Love Song To The Beatles)". Classic 45's. Retrieved May 25, 2014. ^ Whitburn, Joel (1990). The Billboard Hot 100 Charts: The Sixties (4 April 1964). Menomonee Falls, Wisconsin: Record Research, Inc. ISBN 0-89820-074-1. ^ "The Beatles Invade America - A chronicle of the Beatles' first visit to the U.S. in February 1964". February 11, 2007. Archived from the original on May 27, 2014. Retrieved May 25, 2014. ^ Gary Trust (February 19, 2019). "Ariana Grande Claims Nos. 1, 2 & 3 on Billboard Hot 100, Is First Act to Achieve the Feat Since The Beatles in 1964". Billboard. Retrieved March 9, 2019. ^ "UK acts disappear from US charts BBC April 23, 2002". BBC News. April 23, 2002. Retrieved January 18, 2011. ^ "Cash Box Magazine's (USA) Weekly Single Charts for 1964". April 4, 1964. Retrieved November 30, 2017. ^ Gaar, Gillian G. (April 2011). "Women of The British Invasion". Goldmine: 22, 24, 26–28. ^ Ankeny, Jason. "Dusty Springfield - Music Biography, Streaming Radio and Discography - AllMusic". AllMusic. ^ Thompson, Dave. "Wayne Fontana and the Mindbenders - Music Biography, Streaming Radio and Discography - AllMusic". AllMusic. ^ Eder, Bruce. "Herman's Hermits - Music Biography, Streaming Radio and Discography - AllMusic". AllMusic. ^ Gilliland 1969, show 48. ^ Eder, Bruce. "The Searchers - Music Biography, Streaming Radio and Discography - AllMusic". AllMusic. ^ Unterberger, Richie. "Billy J. Kramer - Music Biography, Streaming Radio and Discography - AllMusic". AllMusic. ^ Ruhlmann, William. "The Bachelors - Biography - AllMusic". AllMusic. ^ Ankeny, Jason. "Chad & Jeremy - Music Biography, Streaming Radio and Discography - AllMusic". AllMusic. ^ Unterberger, Richie. "Gerry & the Pacemakers - Music Biography, Streaming Radio and Discography - AllMusic". AllMusic. ^ Unterberger, Richie. "The Honeycombs - Music Biography, Streaming Radio and Discography - AllMusic". AllMusic. ^ Stephen Thomas Erlewine. "Tom Jones - Music Biography, Streaming Radio and Discography - AllMusic". AllMusic. ^ Unterberger, Richie. "The Yardbirds - Music Biography, Streaming Radio and Discography - AllMusic". AllMusic. ^ "iTunes - Music - The Kinks". Itunes.apple.com. ^ "The Kinks". the Guardian. ^ "U.S. Chart Positions". Kindakinks.com. ^ Gilliland 1969, show 38, track 2. ^ Gilliland 1969, show 49, track 2. ^ "The Zombies Biography". Allmusic. ^ "8 May 1965 Hot 100". Billboard.com. Retrieved April 10, 2012. ^ This topic appeared frequently on American Top 40, and Casey Kasem always gave this answer. ^ "Cash Box Magazine's (USA) Weekly Singles Charts for 1965". May 1, 1965. Retrieved November 30, 2017. ^ Perone, James E. "Mods, Rockers, and the Music of the British Invasion." Westport, CT. Praeger, 2009. Print. ^ Petersen, Jennifer B. "British Bands Invade the United States" 2009. Article. ^ Whitburn, Joel (2003). Top Pop Singles 1955-2002. Menomonee Falls, Wisconsin: Record Research, Inc. pp. 602, 603. ISBN 0-89820-155-1. ^ "Remembering the "British Invasion"". Remembering the "British Invasion" - YouTube. CNN. Retrieved April 28, 2016. ^ "Freakbeat", Allmusic, retrieved 30 June 2011. ^ Nicholson, Chris (September 25, 2012). "Freakbeat, The Garage Rock Era". Ministry of Rock. MinistryofRock. Retrieved July 16, 2015. ^ Strong, Martin C. (2000). The Great Rock Discography (5th ed.). Edinburgh: Mojo Books. pp. 769–770. ISBN 1-84195-017-3. ^ Roberts, David (2006). British Hit Singles & Albums (19th ed.). London: Guinness World Records Limited. p. 192. ISBN 1-904994-10-5. ^ "Freakbeat - Significant Albums, Artists and Songs - AllMusic". AllMusic. ^ "The 37th Academy Awards (1965) Nominees and Winners". oscars.org. Retrieved July 27, 2012. ^ "The 35th Academy Awards (1963) Nominees and Winners". oscars.org. Retrieved July 27, 2012. ^ William E. Sarmento (July 24, 1966). "Fourth TV Network Looming on Horizon". Lowell Sun. p. 20. ^ Burgess, Anya (May 10, 2004). "Small is still beautiful". Daily Post. ^ "The Girl Behind The World's Most Beautiful Face". Family Weekly. February 8, 1967. ^ Cloud, Barbara (June 11, 1967). "Most Photographed Model Reticent About Her Role". The Pittsburg Press. ^ "Jean Shrimpton, the Famed Face of the '60s, Sits Before Her Svengali's Camera One More Time". 07 (21). May 30, 1977. ^ Seebohm, Caroline (July 19, 1971). "English Girls in New York: They Don't Go Home Again". New York. p. 34. Retrieved January 6, 2015. ^ Wolk, Douglas (December 13, 2013). "Reanimated: 'Nowhere Men, Vol. 1,' and More". The New York Times Company. Retrieved August 14, 2014. ^ "Surf Music". Nostalgia Central. Archived from the original on October 21, 2007. Retrieved March 11, 2013. ^ McGinn, Andrew (June 23, 2011). "Ricky Nelson's sons revive his legacy with 'Remembered' tour". The Springfield News-Sun. Retrieved June 1, 2014. ^ K. Keightley, "Reconsidering Rock". S. Frith, W. Straw and J. Street, eds., The Cambridge Companion to Pop and Rock (Cambridge: Cambridge University Press, 2001), pp. 117-8. ^ Whitburn, Joel (2003). Top Pop Singles 1955-2002. Menomonee Falls, Wisconsin: Record Research, Inc. ISBN 0-89820-155-1. ^ K. Keightley, "Reconsidering Rock" in S. Frith, W. Straw and J. Street, eds., The Cambridge Companion to Pop and Rock (Cambridge: Cambridge University Press, 2001), ISBN 0-521-55660-0, p. 116. ^ Dahl, Bill. "The Buckinghams - Music Biography, Streaming Radio and Discography - AllMusic". AllMusic. ^ Huey, Steve. "The Sir Douglas Quintet - Music Biography, Streaming Radio and Discography - AllMusic". AllMusic. ^ "Trivial Pursuit: The Test of Dandy Knowledge". Dandyism.net. Retrieved August 31, 2013. ^ Hoffman, Ken (July 4, 2012). "England still swings". Houston Chronicle. Retrieved December 1, 2012. ^ James E. Perone (2007). "1". The Words and Music of David Bowie. Westport, Connecticut, and London: Praeger (Singer-Songwriter Collection). p. 6. ISBN 978-0-275-99245-3. Archived from the original on June 16, 2013. Retrieved December 1, 2012. ^ "Winchester Cathedral by New Vaudeville Band". The Kirkham Report. August 16, 2009. Archived from the original on June 17, 2013. Retrieved December 1, 2012. ^ Leydon, Joe (January 26, 2003). "Shanghai Knights - Film Reviews - New U.S. Release". Variety. Retrieved December 1, 2012. ^ Hoffman, Lori (December 7, 2013). "Show Review: Kickin' It with Paul Revere and the Raiders". Atlantic City Weekly. Archived from the original on April 26, 2014. Retrieved April 25, 2014. ^ "The New Colony Six". Oldies.com. Retrieved March 24, 2015. ^ Voger, Mark (October 10, 2011). "Gary Puckett interview: A perfect Union". The Star-Ledger. Retrieved April 25, 2014. ^ "The Barbarians - Biography & History - AllMusic". AllMusic. Retrieved October 2, 2018. ^ "Are You a Boy or Are You a Girl - The Barbarians - Song Info - AllMusic". AllMusic. Retrieved October 2, 2018. ^ Eder, Bruce. "The Seekers - Music Biography, Streaming Radio and Discography - AllMusic". AllMusic. ^ Eder, Bruce. "The Easybeats - Music Biography, Streaming Radio and Discography - AllMusic". AllMusic. ^ Mark Jenkins (May 3, 2002). "The end of the British invasion". Slate.com. Retrieved January 23, 2014.